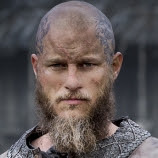 When Ragnar left Paris in season 3 he was between life and death. When we meet Ragnar again in seasons 4 première he is still not awake and in bed. While waking up later that episode and realise that Bjorn arrested Floki he isn't so pleased that he was absent for a while. He found Bjorn stupid in two ways as Bjorn want to go out into the wilderness to find himself, and the arrested of Floki. When Ubbe arrested Floki for the second time the children of Ragnar give him an unwanted situation so he bound Floki in a cave. He visits Helga and her daughter to get them some food. Later we see Helga and Ragnar with the body of Angrboda. They both lost a child now. They both suffer by the ideas of Floki.We see Ragnar free Floki in the third episode because Helga suffered enough. Ragnar also meet Yidu. He and Yidu share the same burden. And those scenes are the ones he starts to use a medicine to comfort his pain and get rest to his mind. King Finehair comes to Kattegat and during the Yol celebrations, Ragnar tells Yidu his biggest secret. We see the father/husband talk between Ragnar and Bjorn and they both don't trust King Finehair. Ragnar now on the medicine of Yidu gets major flashbacks with Lagertha, Gyda, Bjorn and Athelstan this happens underway to Paris. When the first fight between Ragnar and Rollo set sail. The one before the towers he got defeated. When Ragnar sails back to the place they have a camp he can hide for a while. Due to an attack on the camp, he sees his children because they were hiding. When Yidu blackmailed him he drowned her in front of his children (Ubbe and Hvitserk) nearby Paris. They leave the camp to camp up a hill. Genius as Ragnar is he lift the boats up to the hill and walked the boats after the towers to get them in the river again. While doing so he has changed strategy and at first, he wins the first battle but when Rollo attacks the second time it ended up in a fight between brothers. This fight gets undecided because Lagertha gets wounded. After this had happened the fight stops and Rollo lets Ragnar get away back to Kattegat. Back in Kattegat, he decided abandoned each and everyone by leaving Kattegat. When he is back in Kattegat it changed drastically. He sees his children grown up. Also, he feels he was not wanted anymore. He still is King and asks everybody who wants to kill him?